Now that Navratri and Dussera is over, its going to be a mad rush to get ready for Diwali. House cleaning, making savouries and sweets, buying gifts and new clothes, getting all the decor out, competitions, rangolis and so much more. How much ever planning we do, it does seem like a mad rush towards the finishing line! By next week I need to get the parcels ready to send it off to my kids before Diwali. A parcel each to Bangalore, Dubai and Montreal. My new daughter in law, French by birth but becoming fully ‘Patelized’ as we say, loves chevdo and bhusu…. what she calls Bombay mix. I usually give order for the huge amount of chevdo and bhusu required but bake the cookies, make the chakri, farsi puri and other savouries at home. Bhusu is a mixture of rice flakes,sev, dals, tiny namakparas etc. Frying all these things makes my apartment all oily and smells of oil… so prefer to support needy women by giving them the order. 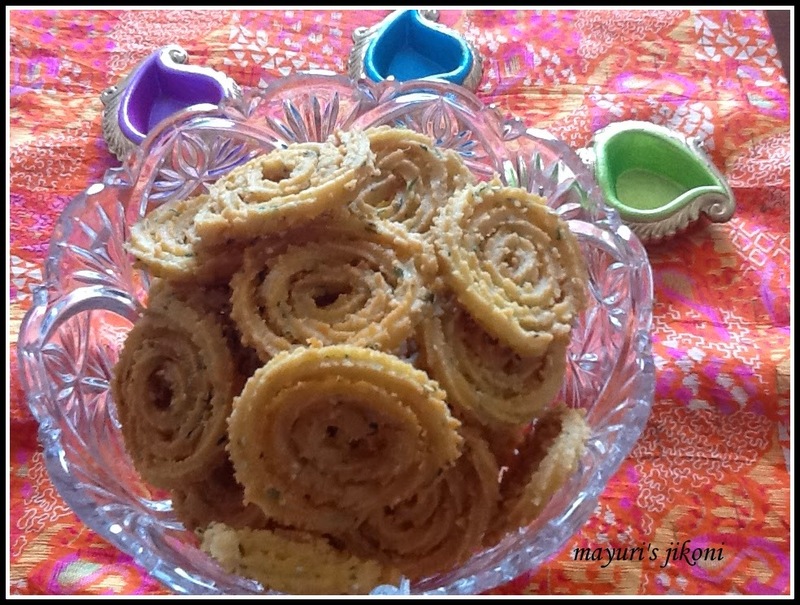 When I had gone for my son’s wedding to UK and France, I had received a request from a follower for an easy chakri recipe. I totally forgot about the request and felt so bad. The thought of making chakris, reminded me of the request. I had to go through my emails to find the request. From now on I record every request or suggestion in my little diary. My dad instilled the habit of noting down everything in a diary, it acts like a reminder, it’s a record of tasks done and still required to be done. I remember some years back when there was something I had to sort out with the bank and I kept calling them to remind them, my dad asked me when I had called them last. I couldn’t remember, thus his advise that everything should be noted down. I travel with the diary with all the important details hand written… still don’t trust computers and mobiles as you never know when they will stop functioning! Getting to the recipe, its a simple chakri recipe made from rice flour and a bit of all purpose flour. I have been using this recipe for years, given to me by a friend. I use to make loads of chakris when the kids were at home. Afternoon snack, in their break box, for guests etc etc. Now I hardly make these fried savouries as I land up eating it all! Sift the flours and salt into a big bowl. Add all the rest of the ingredients except for water. Add water and form a dough which is not too hard and not too soft. In the meantime, get all your equipment ready, a chakri press, spatula, slotted spoon, a colander, a large tray or parchment paper and a frying pan (wok, kadai). Fill the kadai or wok half way with oil. Put the kadai with oil over low heat and let the oil become hot. In the meantime, fill the chakri press with the dough. Make spirals from dough into a large tray or parchment paper. Put a tiny piece of the dough into the oil. If it comes up immediately the oil is ready. Increase the heat to medium and maintain it. Using a spatula, lift the spiralled dough and put it into the oil. Add 4-5 more and fry. When you add the spirals to the oil, let it fry on one side for 1 minute and then flip it over. Keep on turning them occasionally till they become light golden brown. Remove the fried chakri into a colander. Repeat steps 13 to 15 till all the dough is over. As you press the dough out of the chakri press, make the first round a bit closer, and then slowly make a spiral round it without leaving any gaps in between. The end gently press it in to the nearby spiral. Otherwise the chakri will open up while frying. Don’t add more butter, as the chakris will become too soft and break up and become oily. Add ⅔ cup water or less at first, then add more if required. The amount of water required will depend on the flour. If the dough is too hard, the spirals will break up on pressing. Don’t overcrowd the kadai or wok with chakris. Each needs space around it to fry well and to maintain a consistent oil temperature. Please participate in the Diwali event hosted by me. Lovely chakris, its too early for me to start for Diwali. I can munch some without any guilt, crunchy munchies.